The death certificate of Dr. Charles X. Jones, physician, banker, and first elected mayor of Ray City, Berrien County, GA poses something of a mystery. The Informant on the Certificate of Death is Fred D. Jones, son of the deceased and resident of Ray City, GA. 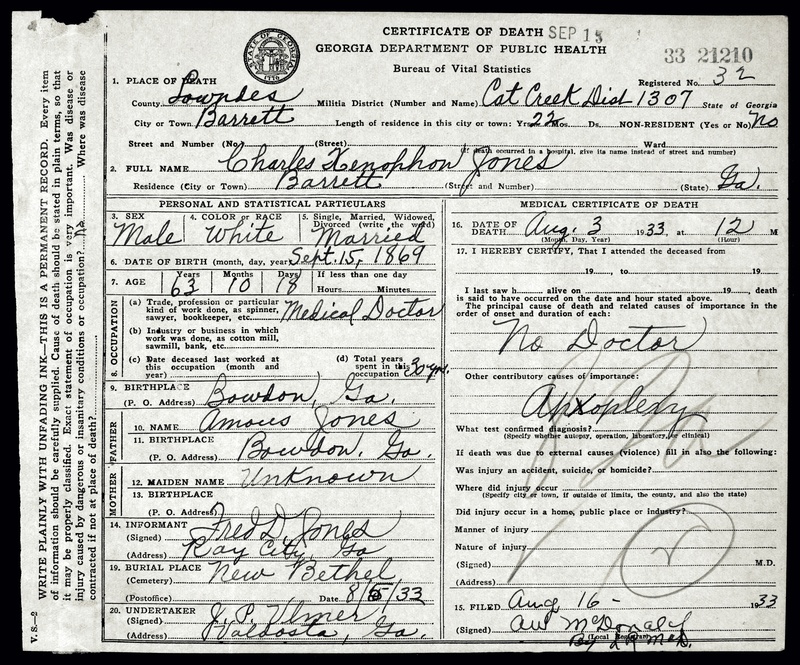 The death certificate bears out that Charles X. Jones later lived in the Cat Creek District of Lowndes County, GA near the community of Barretts; his birthplace in Bowdon, GA; profession as a medical doctor; death on August 3, 1933; and burial at New Bethel Church Cemetery, Lowndes County, GA on August 4, 1933. The undertaker was John Porter Ulmer, of Valdosta, GA. However, in other details the Certificate of Death raises questions. A question about the death certificate immediately arises with the full name of the deceased. In documentation, the name of Ray City’s first mayor appears as Charles X. Jones, but on the death certificate the full name is given as Charles Xenophon Jones. Other sources have given the Doctor’s middle name as Xavier. Is it possible that Fred Jones did not know his father’s middle name? Another discrepancy arises in the names of the parents of the deceased. These would have been the grandparents of the death certificate informant, Fred D. Jones. The name of the mother of the deceased was unknown to Fred. It is perhaps not surprising that Fred did not know his grandmother’s maiden name was Martha H. Word, since he was only about three years old when she died in 1908. Fred gives the name of the father of the deceased as Amous Jones. Yet evidence from census and newspaper records document that the father of Dr. Charles X. Jones was Major William Dudley Jones (1821-1905), prominent citizen of Carroll County and resident of Bowdon, GA. The birth date is also a discrepancy. The death certificate gives the date of birth as September 15, 1869, but the grave marker at New Bethel Church Cemetery bears September 15, 1870 as the year of Dr. Jones birth. An 1870 or later birth date is supported by the absence of Charles X. Jones in the 1870 census records. While Charles X. Jones is absent from the 1870 census, he does appear in the 1880 census enumerated on June 3, 1880 at age nine. This age is consistent with a birth date of September 15, 1870. 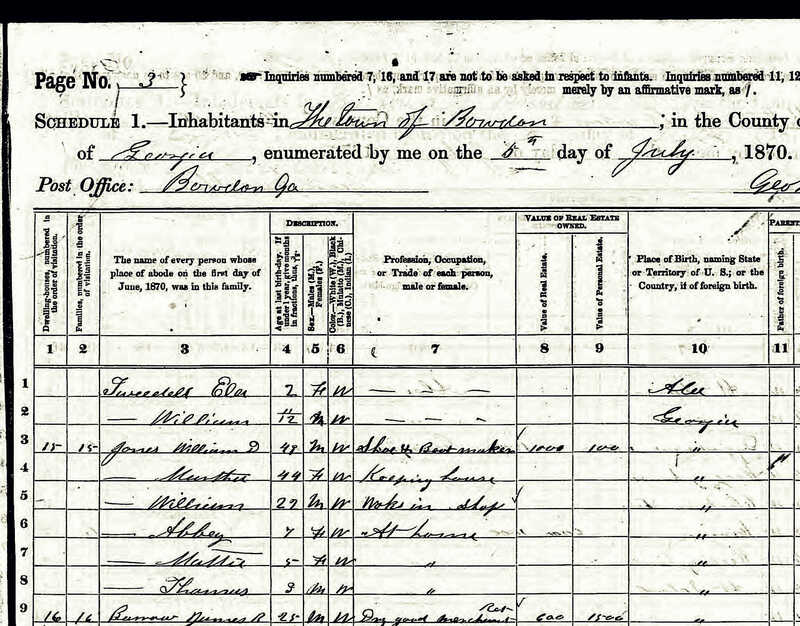 Census enumeration of Charles X. Jones, son of Major William Dudley Jones, in Carroll County, Georgia, on June 3, 1880. A further interesting note is thatno doctor was present at the time of death to sign the Certificate of Death. Instead, the certificate was signed by A.W. McDonald. The cause of death was reported as apoplexy. Arthur Walton McDonald was a brother of Lacy A. McDonald who was a mailman at Ray City, GA. McDonald had known Dr. Jones at least 13 years, having enumerated the Jones household as census taker in the Census of 1920.